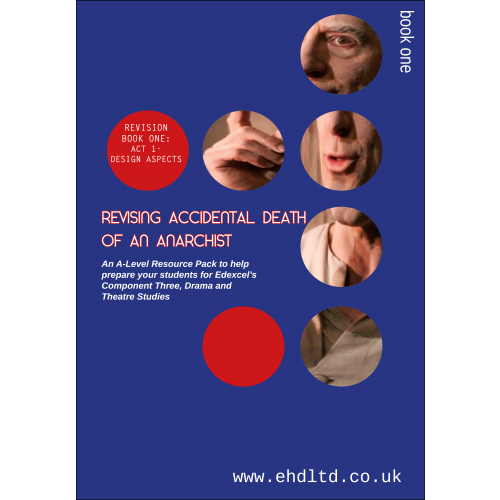 After many requests, we've launched the first book in our range of Accidental Death Revision Products. Created specifically for Edexcel's Component 3, Book One will help students to revise Act One of the play, specifically focusing upon how to look at the act from a design perspective. This book is perfect for you to use with your students once you have taught the play and are starting to prepare them for answering exam questions from the perspective of a designer. This book enables you recap Act One of the play in terms of design choices and the most significant design elements. The booklet is fully photocopiable and is comprised of double-spread pages. These full colour double-page spreads can provide you with a basis for your lesson, or they may be used as supplemental resources for you to use in class, for extra reading or homeworks, or when looking at any extract of the play from Act One. The spreads often provide short activities for students to complete which will allow you to assess understanding and aid revision for the exam. This is the first book in our range of booklets to help prepare students who are studying Fo's text . 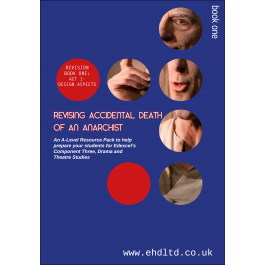 Book One focuses entirely on the two scenes within Act One of Accidental Death of an Anarchist. It provides an indepth anaylsis of Act One, as well as drawing out all of the important aspects of design within this first act and ensures that students revise thoroughly the more signficant features that a designer should consider such as how they might depict Fo's Italian context for a modern day audience, choosing and designing a suitable theatre space after considering the demands and requirements of Act One, the need to repeatedly break through the imaginary fourth wall and how to create the location of the two offices in the first act on a stage, the slight differences between these two offices in the first act and the symbolic importance of windows in both offices. The pages in this book will give students the knowledge and understanding to create their own detailed design concepts for Act One, including helping them to draw ground plans when sketching out their revision ideas for Act One in order to ensure that they have a firm understanding and visualisation of their design concepts before they enter the exam. The activities will also encourage students to consider Dario Fo's political and comedic intentions for this play alongside their own design intentions and how they will convey these in their design choices, employing the use of several significant quotes from Dario Fo which students may choose to learn to help justify their own design decisions and intentions for Act One. This first book will encourage students to consider Fo's repeated use of symbolism and juxtaposition of the serious with the comical within both scenes of Act One and how a designer could tackle these contrasting aspects within their design choices. The book will also help students to consider, when approaching an extract from Act One, Fo's use of stage furniture and props and how a designer would incorporate these into their design such as the use of the desk, filing cabinet, window and also the comedic use of doors on set. There are also resources should a student want to discuss an extract from Act One in terms of both sound design and lighting choices. It provides resources for students to consider aspects such as literal and non literal sound effects present in Act One, diegetic sound and looking at an extract from the first act and exploring it in terms of sound choices sound cues, different effects and techniques, or the intensity, colour, form and movement of any lighting choices in Act One. It will help students to consider the different types of stage lights that could be used by a designer when staging Act One and the angles and position of these lights, considering how a three-point system of lighting such as the McCandless system could be utlised in an extract from Act one. This revision pack will also encourage students to revise costume choices in detail and will explore a designer's intentions behind costume in this opening act of the play. It gives students the opportunity to revise the all of the characters' costume choices in this first act, as well as character props and accessories and offers suggestions and guidance for how to create their own original costume decisions, looking at characters such as the Maniac (and his many disguises) and the Superindendent, and his differences in comparison to the other Police Officers.